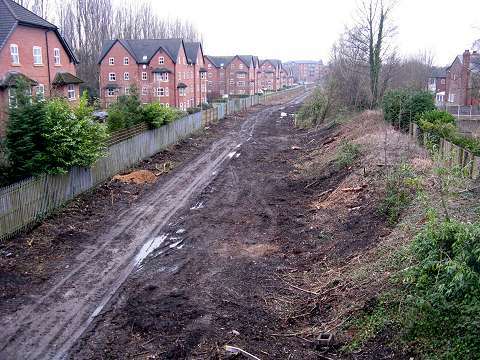 I am writing to you regarding the changes to initial plans for works on the Didsbury Metrolink. The initial drawings submitted warranting planning permission showed an intention to provide a 3m continuous cycle/footway from Didsbury Village station to the Stockport border. This was discussed between the TPT Office and our partners at Manchester and we had no objections and we were therefore happy for our colleagues at Manchester to represent the Trail throughout discussions. The route would only be 2m wide and incorporate steps / wheeling ramp – a route for walkers and cyclists should be 3m wide as per our Design Guide and the CA Shared Routes for All. Steps will prevent families taking their children along the route, alienate 3 wheeled bikes / trailer bikes / recumbent cycles. Wheelchairs users will not be accommodated and the elderly will not be able to use this as a direct route to either the tram stop or the local supermarket and other facilities in Didsbury village. 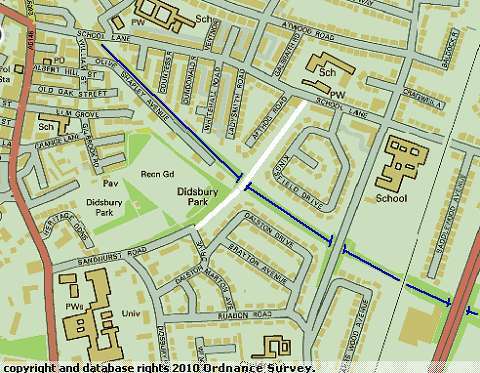 Diverting the Trail along Olive Shapley Avenue, instead of along an off-road route within the cutting: Olive Shapley Avenue is a cul-de-sac with only one footway – this would be both problematic to Trail users and also residents. Nationally the Trans Pennine Trail counts over 900,000 people from all walks of life using this free recreation / travel facility that is open to everyone, without prejudice. To now find out that residents of Didsbury will be unable to use their own local section is extremely disappointing. I also understand our partners at Sustrans are unhappy with the current proposals and I would like to ask you to reconsider what options are available. Can I firstly say that GMPTE do recognise the value and popularity of the Trans Pennine Trail and that is why we have endeavoured to accommodate it within the corridor notwithstanding the fact that our powers for the Metrolink extension to East Didsbury do, in fact, make provision for part of the Trail to be closed altogether. The powers to construct and operate the new line are conferred by the Greater Manchester (Light Rapid Transit System) (No 2) Act 1990, the Greater Manchester (Light Rapid Transit System) Act 1991 and the Greater Manchester Light Rapid Transit System (Didsbury) Order 2003. These powers have been in place for some considerable time and remain "live". At the time of seeking these powers, the width of the Trans Pennine Trail was not specified and, as indicated above, they make provision for partial closure. However, we have ultimately achieved what we feel is a satisfactory and cost effective overall design solution which meets the needs of all users of the corridor. The current design provides for the Trail to be 3m wide with the exception of the sections between Parrs Wood Road and Sandhurst Lane, and behind Barlow High School sports fields. In this latter respect, we are currently liaising with Manchester City Council and Barlow High School to investigate the possibility of utilising a strip of the school land to enable the Trail to be constructed at 3m wide at this location also. Whilst this would still leave a 2m wide section between Parrs Wood Road and Sandhurst Lane, this is a significant improvement on the width (and condition) of the Trail compared to how it existed prior to our works. 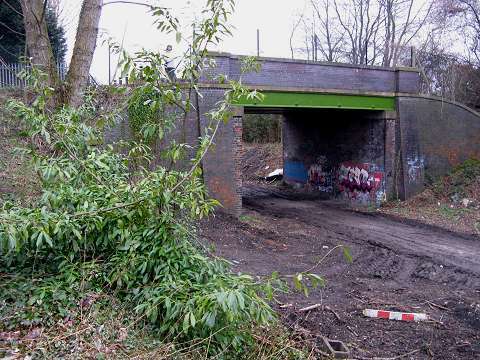 The introduction of steps has proved necessary as there is insufficient width beneath the Sandhurst Lane bridge to accommodate both the Metrolink tracks and the Trans Pennine Trail. I believe that there are similar steps elsewhere on the Trail. The alternative solution of providing ramps has been discounted on the basis that it would not offer value for money and would be unduly intrusive for nearby residents. Indeed, it is by no means certain that ramps could be constructed without requiring land from nearby properties, if only for the construction period. Routing the Trail along Olive Shapley Avenue extends the on-street section by only a relatively short distance. Pedestrians and cyclists are perfectly well accommodated here and I do not believe there will be a problem either for Trail users or residents. If you wish to attend at our offices to discuss this matter further, I would be more than happy to arrange for one of my team to go through the design in more detail with you. Update January 2012: This page is now history, as following much pressure from cycling groups and councillors, the problem bridge has been demollished and is being replaced by a new one with a longer span to allow the trail to pass beneath. Well done to all concerned. It will, however, not be possible to access the trail from the cycleway which crosses the bridge, as the steps which allowed this have been taken away. 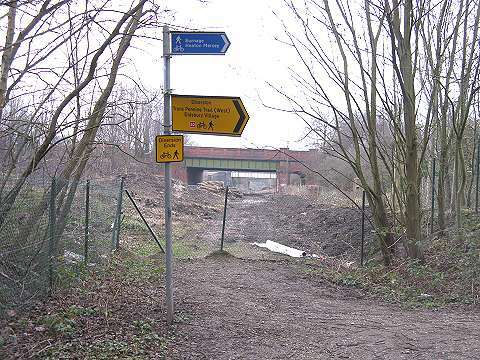 The Trans-Pennine Trail uses the old Midland Railway trackbed in the Didsbury area, which is now to be used for an extension of the Metrolink tramway to East Didsbury, so a section has been closed for some months, with a diversion round by the roads. The picture above is looking west from the current end of the trail. It is intended to provide a cycle route alongside, but there is a problem with one of the bridges which, it is now suggested, will have to have steps either side. In February 2011 we went along with our cameras. 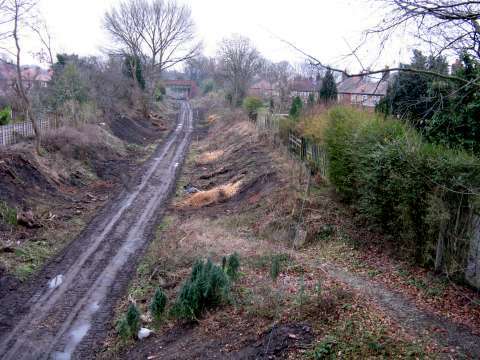 It is notable the LNWR Styal Line railway, Parrs Wood Road, and Kingsway were built when the Midland Railway line had already been in use for some time, so the railway was able to insist that bridges able to carry four tracks should be provided, to allow for future expansion. This map shows the situation. The bridge in question is where an old lane, now barred to motor traffic (shown in white), crosses the trackbed (shown in blue) on a bridge built only for a double-track railway. This is what the controversial bridge looks like from above. 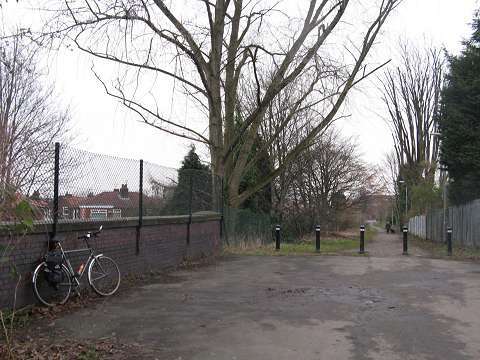 It is currently a signed cycle route which provides a useful access to Fletcher Moss Park. 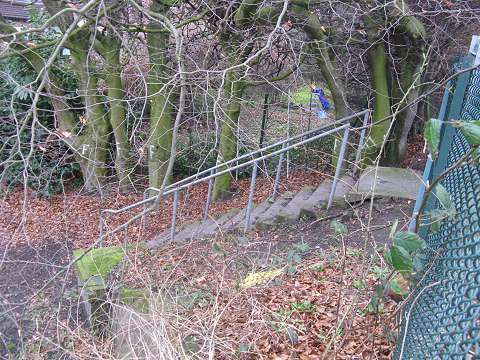 These steps, currently fenced off, lead down to to the trackbed on the Stockport side of the bridge. Looking towards Stockport along the closed section. Trees have been felled - it certainly looks like plenty of width is available. Looking towards Didsbury, with the recently-built homes of Olive Shapley Avenue to the left. Clearly there is not room under the bridge for double track and a cycleway, so Metrolink are suggesting flights of steps, which they say exist elsewhere on the Trail. 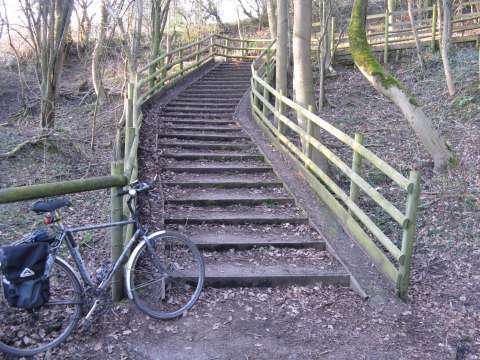 This view of the steps on the route between Twinnies Bridge and Styal, (not on the Trans Pennine Trail!) suggest what such steps might be like, with ramps for pushing your bike on either side. But since the TPT is supposedly intended for use by long-distance cyclists with loaded panniers, is this a suitable solution? Out of interest: this old map from 1907 shows the same area, revealing that the bridge was provided for access between two parts of Whitehall Farm, which the line cut across. 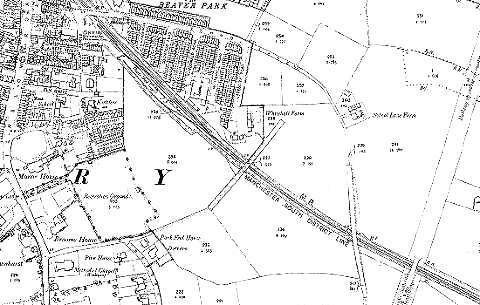 The Olive Shapley Avenue area was a railway goods yard. The Styal line railway can be seen to the right of this plan, under construction. Near the top are three streets of terraced houses called Winifred Street, Countess Street and Dundonald Street, named after the owner of the land at that time, Winifred, Countess of Dundonald, who lived at Gwrych Castle, near Abergele. Similar groups can be found elsewhere in the area. Integrated Transport Authority (GMITA) members asking them to say "No" to Metrolink's plans to install a series of steps into the Trans-Pennine Trail as part of the Didsbury tram extension. Between us we sent over 550 email messages and as a result of our lobbying a lively GMITA committee meeting on Friday 25 March saw a succession of councillors from all political parties lining up to question the planned steps. The Committee unanimously voted NO to the steps proposal. One councillor when questioning Metrolink's cost projections for the steps and the other solutions referred to the costs as being a "deluded fantasy". Hard not to agree. GMPTE/Metrolink officers have been instructed to go away and come back with an acceptable proposal. We will need to keep a watchful eye on this to make sure they don't try to take a step backward. But hopefully the revised proposals will be acceptable to the Trans-Pennine Trail organisation, Sustrans, user groups and local residents.